Arrive at your event in style. Capable of pulling up to 2 adults, our llamas love taking people on adventures. Popular for everything from Birthday parties to music festivals, why not invite a couple of llamas to attend your event? Led by their handlers, these guys freely move through the crowds for kisses, pats, photos & selfies. An experience that many aged care facilities are already taking advantage of (to the benefit of their residents) is Elliot the alpaca. Elliot loves visiting nursing homes and saying hi to all the residents. His small size makes him ideal for navigating indoor spaces and his gentle nature means he is fantastic with the residents. Want to take a llama for a stroll? Join us for a guided walk through the beautiful Ben Ean vineyard with a llama as your walking companion. Want to make a splash at your next event? Why not hire the llama kissing booth? Invite extraordinary to your big day. 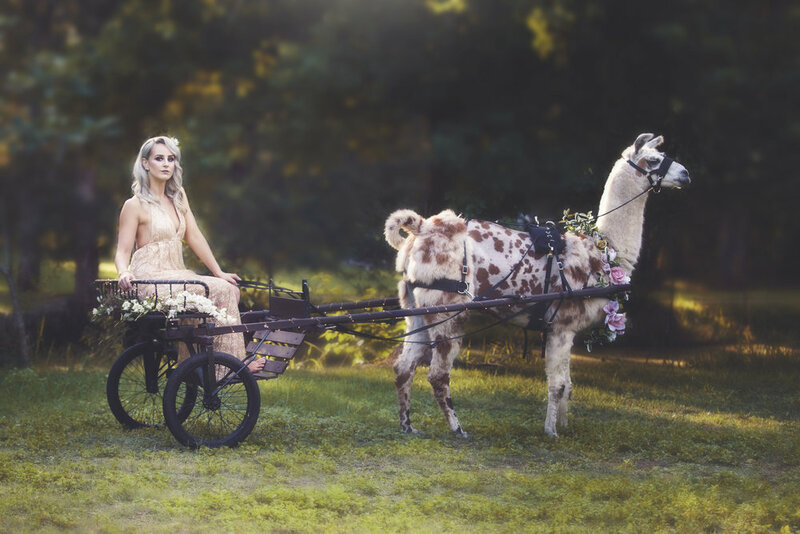 Llamas bring tons of fun for your guests and will make the perfect accessories in your wedding photos. When it comes to unique, we wrote the book. If you want your wedding to stand out from the crowd, give us a call. Why not hire a llama or two to make your event extraordinary. The Llama Collective is available to bring these amazing animals to you. Their gentle and inquisitive nature allows us to provide a unique interactive experience suitable for all ages. They are extremely social animals and really enjoy interacting with people and the environment making them perfect for festivals, parties, photo shoots and much more! Want them to come inside? No problem! They are clean and will toilet outside. Providing something few can offer our highly trained animals can provide a range of experiences on the day. From touching or feeding them to posing for photos, dressing up for the occasion or even carrying things in their packs! Our llamas health and wellbeing is extremely important to us, as a result, their appearance is subject to some terms and conditions. Our team are our family, when they are not working they live out their days in a herd environment to make sure they are happy and healthy. Located in the Hunter Valley we are able to travel across the Hunter and beyond. Get in touch with us today to organise a one of a kind experience with these truly wonderful animals.